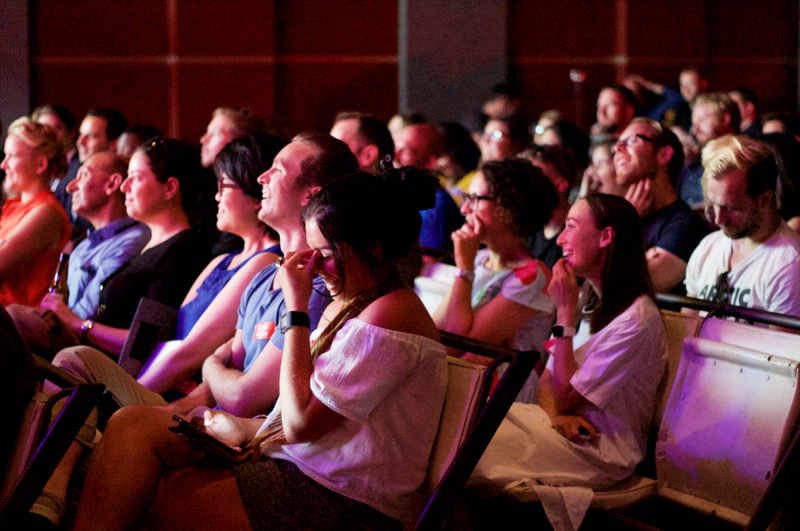 The Sydney studio hosted its first ever ustwoTHINKS event earlier this year. The theme for the evening was something that has very much been on the ustwo radar for a number of years now - JFDI (or Just F*ing Do It). We felt that this theme would resonate with the tech community as businesses try to embrace a more experimental culture. The topic was fun and a little bit risque, so it wasn’t difficult to find great panelists with an opinion on the subject. 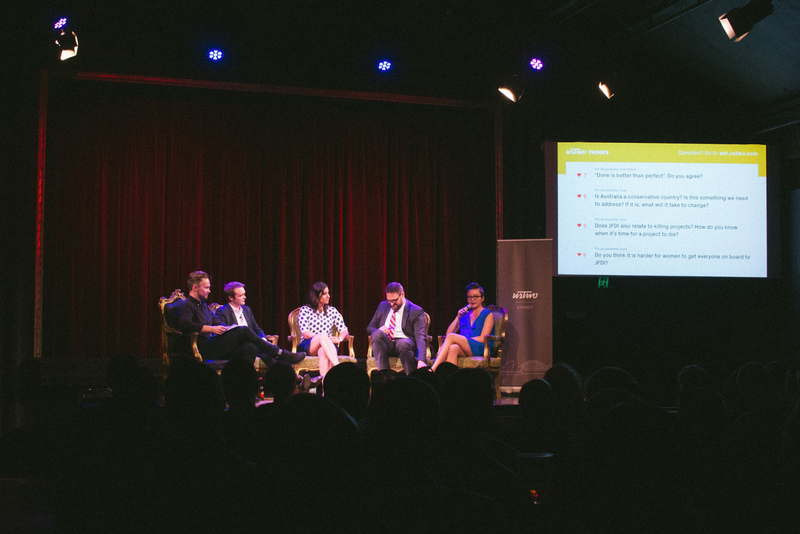 Our line-up featured Wyatt Roy, the Assistant Minister for Innovation, Tiziana Bianco, Global Head of Innovation Labs at CBA, Yvonne Lee, Co-founder and Design Director at Wildwon Projects, and Josh Bolot, Director at Monash Private Capital. 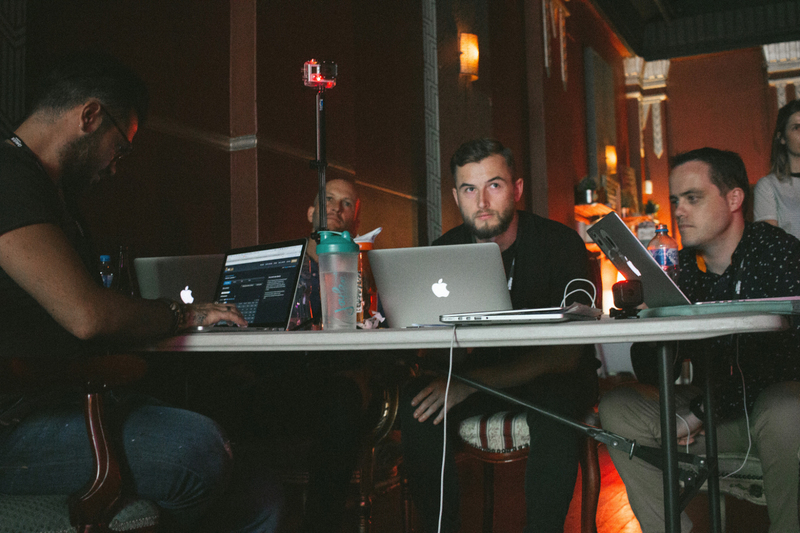 In the spirit of JFDI, we decided that there was no better time to build something (whether it was a website, mobile app, or wearable) for the event. There were a couple of themes we wanted to address in the creation of this application. First of all, we wanted to make sure that it helped to provide an inclusive experience for everyone involved. 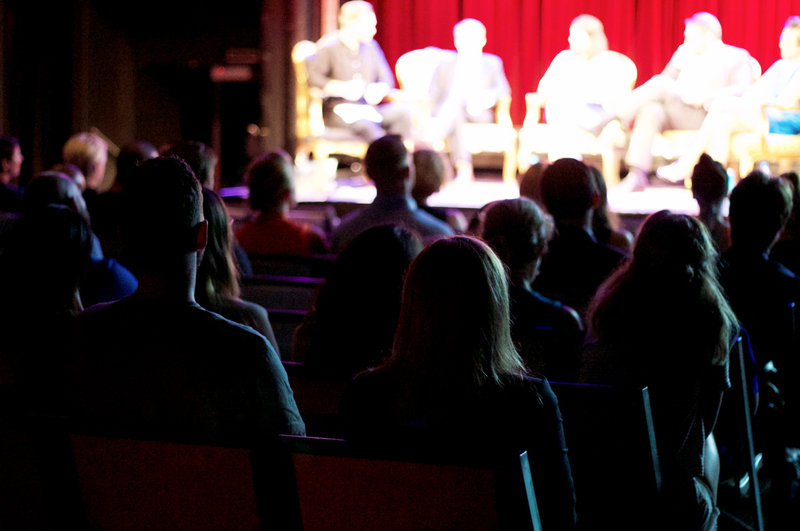 Secondly, we wanted to play around a little and experiment with the event format itself, so we ran a couple of brainstorming sessions where we looked into the opportunities and weak points of panel-style events. There were a couple of key takeaways from these sessions. The most interesting of these was around question time at the end of the event; What if you’re too shy to ask a question? 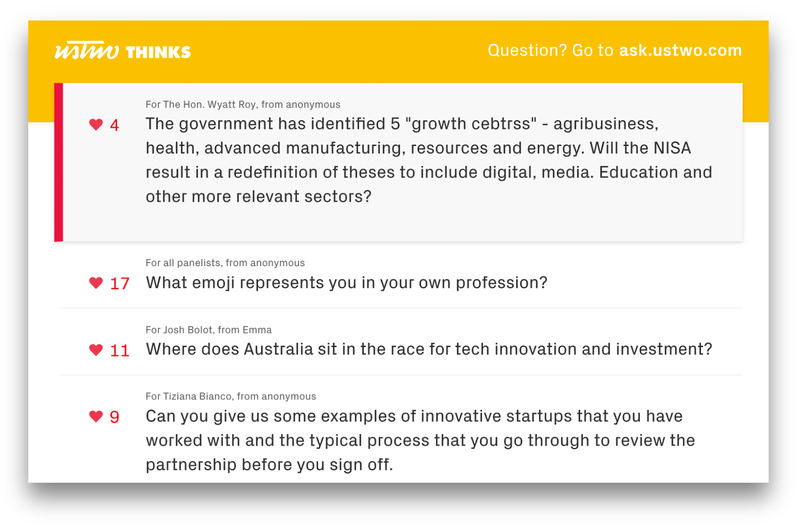 How do you ‘defuse’ the people who don’t really have a question and just want a soapbox? How do you make sure that the most interesting questions aren’t lost in the fray? Making a digital solution to this problem seemed like a great way to make ustwoTHINKS more inclusive for the audience. The question was asked by the team: why not just use Twitter? Two reasons. First, we wanted the audience to ask questions, not the general public (or worse yet, trolls). Second, it was imperative that we were able to moderate content ourselves in order to prevent any inappropriate or offensive content coming up on the big screen. 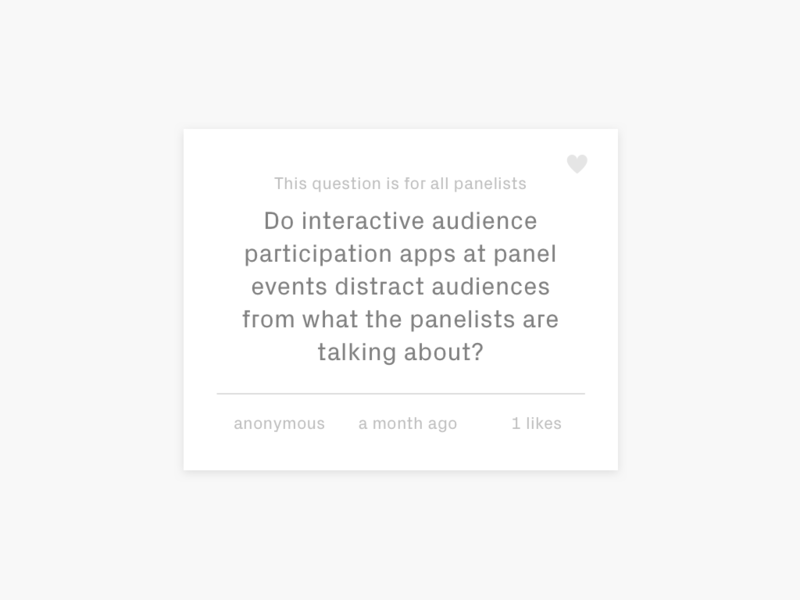 The result was a product that we playfully named ‘The Asset’, designed to be a frictionless app with a single purpose: to allow audience members to post questions to the panelists and up-vote other questions, using their phones to do so. Up on the big screen, ‘likes’ ticked over with a cute animation, and the most popular questions floated to the top where everyone including Joel, (our Head of Studio and MC for the night) could easily see them. Our biggest fear was that, in trying to be useful and clever, we had built something that inhibited or tainted the experience of the event. It was a bit awkward at first, however questions with more likes soon floated to the top. Thankfully the awkward question wasn’t addressed to the panelists… the system works! In between people asking questions on their phone and the questions appearing on the big screen, a bunch of us were busy at the back of the room, approving posts like demons. Obviously we had to change the name to something that reflected the nature of the product. With our sister studios in London, New York and Sweden launching “Talkies” events, in the name of staying on-brand, we called it Askies. 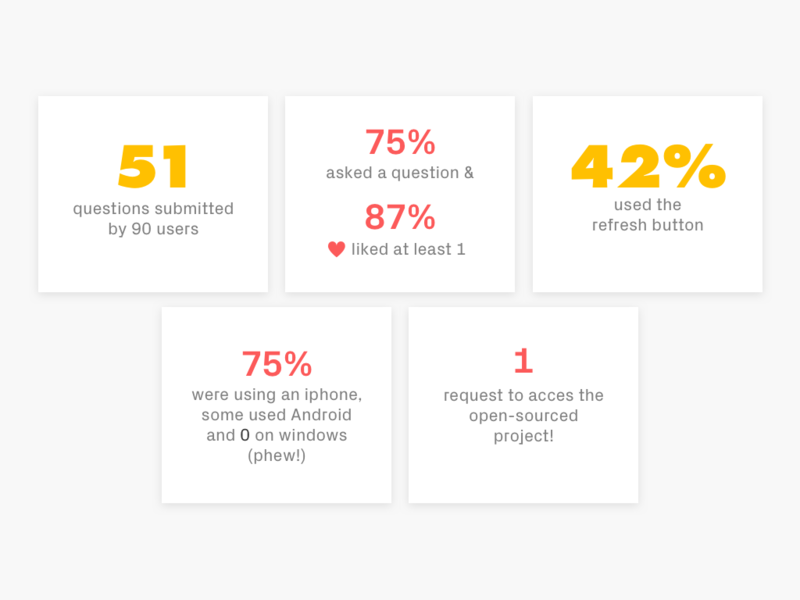 Who knows – it could be ustwo Sydney’s first product. We plan to support it pretty heavily for those who are interested in using it here in Sydney. We’ll post updates on this so stay tuned. Our studio down under is packed full of energy and dedicated to delivering stand-out work for clients including Commonwealth Bank, Amaysim and Westpac. For more information or any comments, drop us a line at hello@ustwo.com.